Jesus vs. The Borg. On first glance one might assume that Jesus has very little chance against the collective force of the Borg hive. 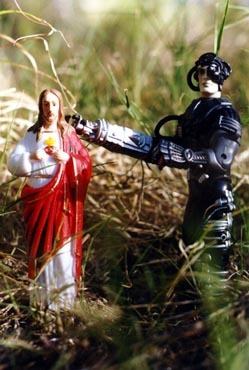 But what exactly would happen to the Borg if they absorbed Jesus? I don't mean the question to be disrespectful, even if I think the value in examining the question is best revealed with a good sense of humor? The idea of the Borg, as a race living in a collective unity, is presented on Star Trek as a faceless nightmare taken to an extreme. Jesus taught that a collective unity of love would be a paradise of salvation and connection with the Universe / God. Does the idea of collective unity bring up both great pleasure as well as intense fear? And what can we learn from our fear? Is the dream or nightmare of unity ultimately inevitable? Do we get to choose between the dream or nightmare interpretation? Remember the background music, when Riker had to fire ship's weapons at the Borg absorbed Picard. Imagine if Picard had to fire on a Borg Jesus. That background music would be really intense. "Mr. Warf. Fire!" (Dun Dun Dun! Dun Dun Dun!) Oooh, or what if he decided not to fire. Or what if he didn't have to? Relationship to the Core Wave: "Do good ideas replicate and spread in a way similar to viruses? If something is inside of us is it automatically a part of us?" --r.c.c.